— the online article can be read here. Rod Sánchez was selected to paint the portraits of the Colombia National Team for publication in Tschutti Heftlimagazine. The 2018 Tschutti Heftli Collectors Album can be purchased a the Tschutti Heftli Online Shop. Proceeds go to the humanitarian charity Terre des hommes, a Swiss child relief agency. The painted portraits include: James Rodriguez, Radamel Falcao, David Ospina, Juan Cuadrado, Carlos Sánchez, Frank Fabra, Santiago Arias, Abel Aguilar, Edwin Cardona, Davinson Sánchez, Cristián Zapata, and coach José Néstor Pérkerman. Our film "Winged Painter" will be shown at the Palm Springs International Animation Festival at the Palm Springs Art Museum. All donators to RAINN charity will be showcased at the festival screening. Thank you for all of your support! NYU Constitution Day Poetry Slam! 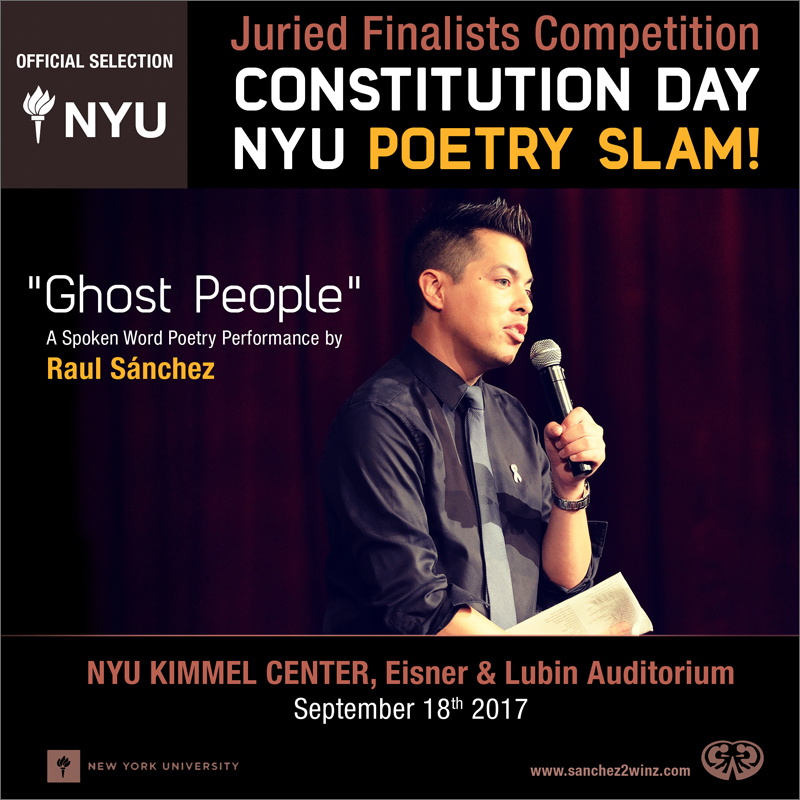 Raul Sanchez's Poem "Ghost People" has been OFFICIALLY SELECTED in the FINALISTS COMPETITION at the NYU Constitution Day POETRY SLAM! Raul will be one of 10 finalists performing the poem before a panel of NYU Faculty judges. 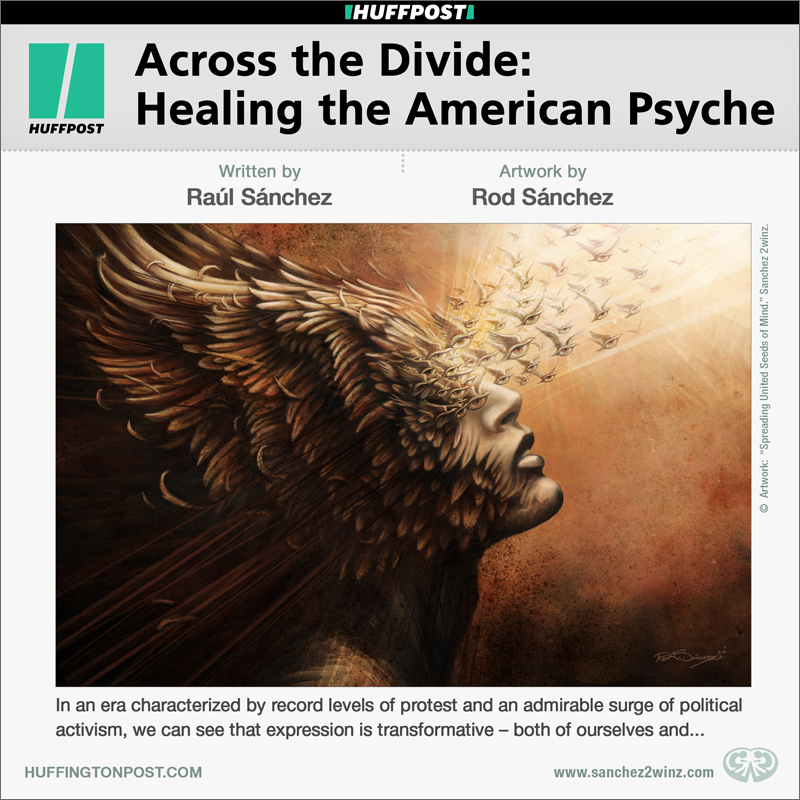 "Across the Divide: Healing the American Psyche"
Raul met with several New York Times bestselling authors at a recent event that talked about writing the resistance, as well as writing to promote healing across divides. We’re all shapers of a better future when we work together. Rod's Painting "One Vision" was officially selected in the "BORDERLESS"exhibtion. Come celebrate unity with us on opening night this Friday 02/03/2017 – the exhibition is in collaboration with other exceptional artists. Huff Post Interview with "Walking Dead's"
Rod's Painting "TRANSMISSION FROM A SILENT HEAVEN" officially selected in the juried "Show Your World" International Art Exhibition in New York City. Rod's painting "WHEN URANIA CRIES" officially selected in the Juried Semi-Finalists Exhibition in New York City. Our film "Winged Painter" will be shown at the New York Short Film Festival at the Cinema Village Theatre on opening night! All donators to RAINN charity will be showcased at the festival screening. Thank you for all of your support! "One Vision" by Rod Sanchez. Are you wondering how to negotiate in any aspect of life? Find out 6 tips in our recent piece: "Changing the Negotiating Game - 6 Tips for Smart Success." The key is building trusted relationships and bridging differences in ideas and values. "Winged Painter" nominated for 2 AWARDS: Best Music Video & Focus On Art Award at the Orlando Film Festival 2015! All donators to RAINN charity were showcased at the festival screening. Florida National News reported on the event. New interview featured in Making Music Magazine! In the piece, the duo that's been collaborating since birth talks about twin hood, creativity, live cinema, and storytelling through art & music. Check it out and stay tuned for the next single "Resurrection Heart" which hits iTunes in August. New interview published on SonicBids with Sanchez 2winz! 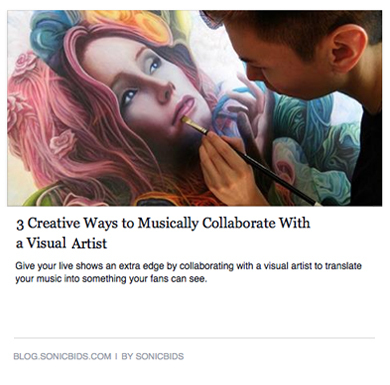 In the article, we & other bands talk about the creative process of audio/visual collaboration. Enjoy & thank you for sharing the art! Share 2 Win Event on our Facebook page this Tuesday, 12/16! Win big signed prints of the Tori painting below! One of the three winners will also win a collectible magazine featuring a rare interview with Tori! 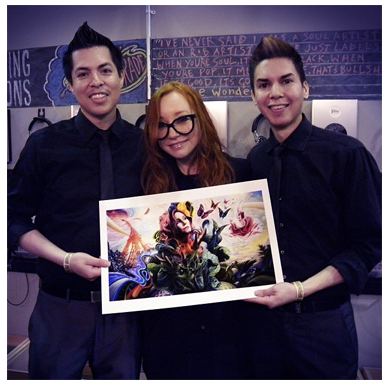 We treasure this shared moment – Happy Hellza-Poppin' Birthday to the lovely Tori Amos! It's a great pleasure to celebrate your existence. Thank you for you, your music, & your inspiration. A COLOSSAL shout out to all that donated – together we raised over $1,000 in funds in tribute to Tori Amos & for RAINN charity! In warm thanks, all donors received a special name credit in the "Winged Painter" Official Video. Big thanks to Undented + RAINN for your support!